Glorifying the supposed arrival of art direction on the web is one of the latest trends in interactive design. There are several galleries devoted to it. There’s even a plug-in for it. Sadly, many designers don’t understand the difference between design and art direction; sadder still, many art directors don’t either: Art direction gives substance to design. Art direction adds humanity to design. The Death of the Blog Post popularizes the “blogazine,” an amalgam of a magazine article and a blog post. The article posits that the featured designers have broken new ground, and have started to bring “art direction” to the web. That description reduces art direction to little more than a unique design for each blog post. The term blogazine is an embarrassment to art directors everywhere. It’s like saying, “Look! This blog is like a magazine because every post is different!” Often, the “blogazines” simply contain dressed up blog posts. Magazines don’t set out to simply decorate stories individually. Their goal is to combine visual imagery and language to enhance the story’s meaning. Design variations are a result of that desire, not a cause in and of itself. On a magazine staff, art directors and copywriters spend a tremendous amount of time brainstorming different ways to enhance a story, from choosing the design style, selecting related content features, and honing the story’s tone of voice. To translate that process to the practice of web design, we need different frameworks to give us flexibility within a given format. Custom fields for styles within content management systems at the individual post level are a start. However, the ability to write custom CSS doesn’t automatically mean a blog post has been art directed. Art direction transcends custom blog posts. It is something different and extraordinary. Art direction elevates and enhances meaning. Art direction brings clarity and definition to our work; it helps our work convey a specific message to a particular group of people. Art direction combines art and design to evoke a cultural and emotional reaction. It influences movies, music, websites, magazines—just about anything we interact with. Without art direction, we’re left with dry, sterile experiences that are easily forgotten. Can a New York subway ad about the homeless provoke you to donate money? Why do you want to beg Clarice Starling to turn around, even though you know she can’t hear you? How do candles transform a regular meal into a romantic evening? Art direction is about evoking the right emotion, it’s about creating that connection to what you’re seeing and experiencing. By contrast, design is the technical execution of that connection. Do these colors match? Is the line-length comfortable for long periods of reading? Is this photo in focus? Does the typographic hierarchy work? Is this composition balanced? If I tell my wife that I love her, but say it with a frown on my face, she’ll get mixed signals. If I say it nonchalantly while watching TV, she might not fully believe it. But when I say it with a genuine smile and a bouquet of flowers, my meaning is clear. In this example, my love is the art direction, while my smile and the deep red color of the roses are the design. They work hand-in-hand to deliver the point emotionally and physically. Design is perfection in technique; art direction is about the important, yet sometimes intangible emotion that powers the design. Does this color scheme fit the brand? Is it appropriate for the situation? Bright colors may not fit a sad message. Do these colors look good together? Are they vibrating? Is each color the best choice for the medium, e.g., Pantone swatch for print, web-safe online? What does this font connote? How do the letterforms themselves send the message without the actual words? Comic Sans might be too silly, but Helvetica might be too vanilla. Does my assortment of type sizes create the right visual hierarchy? Does this font have enough weights to be used in this context? How balanced should this composition be? Balanced compositions are pleasing but often passive. Unbalanced compositions are often uneasy and unsettling but visually more interesting. Are my margins even? Is there a natural rhythm in the visuals that will guide a person’s eye through the piece? How well do the visuals support and convey the mood of the brand? What is the message or story the design conveys? How well do the visuals align with the brand guidelines for logo spacing, appropriate typography, and color palette? Does it feel good? Does it look good? Design is the how. It’s the foundation of all communication, the process and production of typography, color, scale, and placement. Art direction is the why. It’s the concept and decisions that wrap itself around the entire product. The act of designing is different from the act of art directing. Art Directors are supposed to provide the concept. Designers are supposed to bring ideas to the table and implement the concept. However, it is important to point out that it is almost never that black and white. Designers do art direct and art directors do design. Art direction is a filter for making judgments; you pass every design choice through it. Start by determining the overall emotion. All the copy, photography, UI elements, buttons, and the kitchen sink should be pinged against this ideal. I like to think of it as the Magic Kaleidoscope Looking Glass. It helps to determine which path I need to take when struggling with design decisions. I used to teach graphic design at the University of the Arts in Philadelphia. In an assignment I borrowed from Happy Cog Creative Director Christopher Cashdollar, I had students select slips of paper from each of three hats. The first hat contained the assignment, the second hat contained various design elements, and the third hat held the art direction. 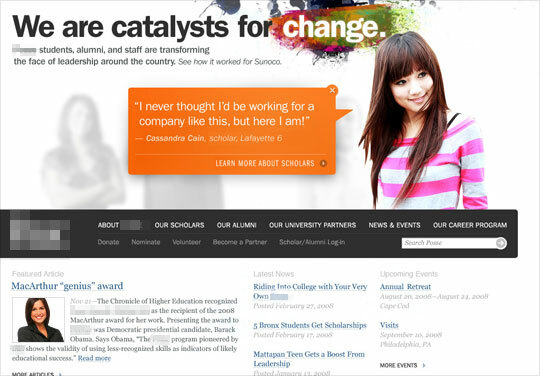 A student’s assignment might be a homepage redesign for the graphic design department. 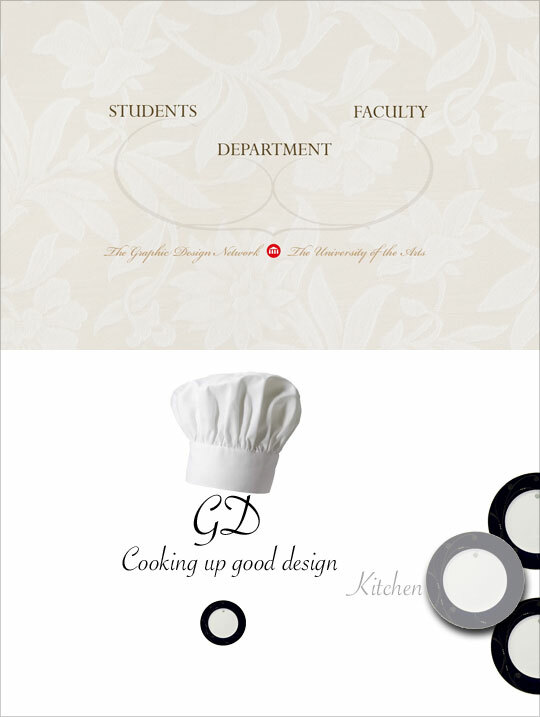 The design direction might specify dark colors and Swiss typography, while the art direction specifies “happy” and “cheerful.” Another student might get design elements that include an earthy color palette and script typefaces to create a menu for a restaurant whose art direction is elite and formal. Fig. 1 A formulaic approach to teaching the difference between art direction and design yielded some interesting results for these students. More a theoretical exercise than a practical one, the students started to develop a feel for what were more natural combinations: Bright colors are easier to work with for happy pieces. A script typeface is a design element that naturally makes a piece feel formal. More importantly, the students started to understand the unusual and exciting possibilities of uncommon combinations. How can you create a happy website with dark colors? You might create a unique illustration style that bridges the two. How do you make a formal-looking brochure without a script typeface? Try moderately sized, light serif type on a dark background with ornaments. Though these are stereotypical examples, the students developed a sense of how to make the world see what they wanted it to see, despite working within tight constraints. Art direction transcends constraints; in fact, it thrives within them. Do an image search for the term “happy birthday.” You’ll find some of the most horrendous design crimes ever committed: Exceedingly offensive color schemes. Repulsive typography. Clip art graveyards. Yet, they all get the point across: Fun, celebration, and happiness. Most are poorly designed, but we all intrinsically know how to art direct a birthday card. It’s no coincidence that they all gravitate toward similar color palettes, typography, and messaging—if you can even call it that. The obvious joyful art direction all but dictates the design elements. Design fundamentals like grid systems and the Golden Ratio aren’t exactly household terms, but most people implicitly understand art direction. Fig. 2 The design makes my eyes bleed, but the art direction is spot on. The widely varying role of “art director” adds to the confusion around the difference between art direction and design. At one extreme, some agencies hire art directors who are terrible at design but understand it well enough to give direction to designers. On the other hand, some agencies have “art director” as the next logical pay grade in the path to become an experienced designer. Most workplaces are somewhere in between. Many smaller agencies don’t employ an art director for many reasons. That fact misleads us into thinking that art direction is an optional part of the creative process. However, the opposite is true. Art direction is so crucial that it is never skipped, only inadvertently and subconsciously performed by designers who often aren’t ready for that type of responsibility. I was once part of a design process where several designers pitched independent concepts to the same client. Built on a freelance model, we made our process non-hierarchical—more collaborative than competitive—but we often lacked a cohesive vision on each project. Each designer was responsible for the art direction and design (not to mention creative direction, a separate topic entirely) of our respective comps. As a young designer, I had a strong grasp of the elements needed to compose an appropriate design: Color, typography, layout, and the like. But I lacked the experience to be a good art director, especially to art direct myself. Without an art director to oversee my work, I produced well-designed pieces that were poorly art directed. Many consider “look and feel” to be synonyms instead of complements, treating them interchangeably. Creating a design is creating the “look.” The “feel,” however, warrants specific attention from a seasoned art director to ensure that the message isn’t compromised. Fig. 3 Thank goodness the client had the wisdom to reject my comp. While the design may be well-executed—ample typographic hierarchy, harmonious color schemes, strict grid, dynamic composition—the art direction isn’t quite appropriate for this nonprofit. It’s too trendy, the hero piece in the header drives home an awkward point, and the paint splatters really have nothing to do with the brand. Fig. 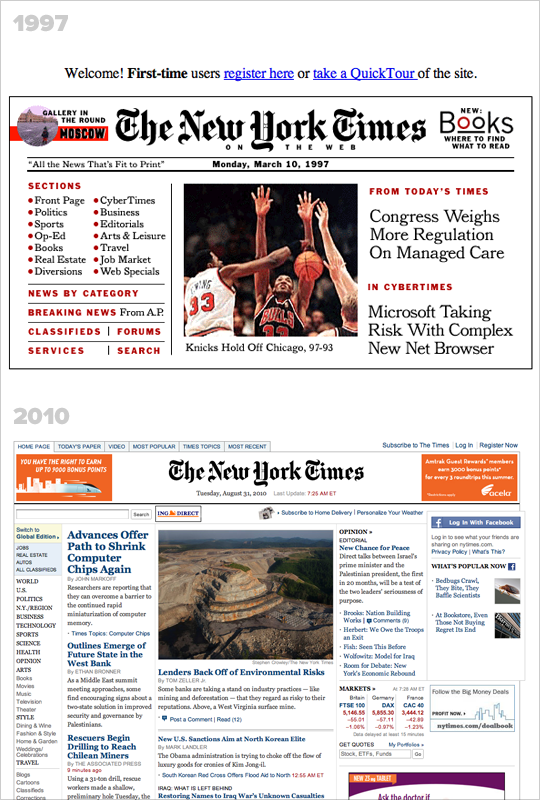 4 As the minimal art direction has remained constant, the New York Times design has been updated over the years to adapt to the changing need of its readers. This is where art direction thrives: deciding which moments to scream from the mountaintops and which moments to keep as secrets. We’ve defined art direction, but what does it look like in practice? It’s quite compelling when you find a piece where the story and design support each other and allow the concept to shine through. Though few and far between, great art direction and design on the web isn’t unattainable. Fig. 5 Launchlist: a winning combination of art direction, copy, and design. 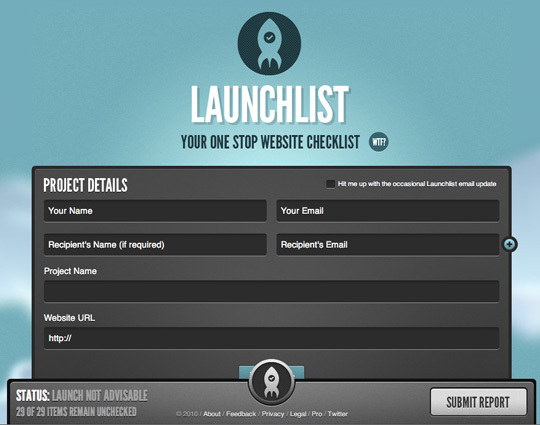 Consider Launchlist, a “one stop website checklist” you can use to make sure your website launches go smoothly. The space shuttle launch metaphor informs us of the decisions behind the feel, the look, and the messaging. The sky-like backdrop and slow-moving clouds aren’t an arbitrary (or gimmicky) choice. The interface’s metallic color scheme suggests a physical console. Clever yes/no sliders instead of checkboxes feel like you’re completing a process rather than toggling a default browser element. Status messages, including “launch not advisable” or “go for launch” reinforce the simulated mission control environment. All of the details elevate the experience. This is a great example of art direction, in that it engages our imagination. If we can do that for anyone that interacts with what we create, we’ve done much more for them than we could have hoped. When my grandfather died, I wrote about it. I wanted to share my memories of his life. I considered the art direction, the mood of what I wanted to say: Reflective, somber, reverent. I wanted to create a digital memorial. I have a system for my site—strict templates that limit much flexibility—so I worked within those constraints. Instead of creating large tabloid-esque headlines like I normally do, I set this headline moderately in small caps and increased the amount of space around it. I didn’t need to do anything drastic with colors, layout, or imagery. I simply modified my design in subtle ways to accommodate the change in this post’s art direction. I didn’t just want to change the design for its own sake. I wanted my readers to understand how special my grandfather was to me. I wanted to convey my thoughts and feelings in a compelling way, and to change their lives, even if in a small way. I wanted them to empathize with me, to be a part of the moment with me. Art direction, not just design, is what made all the difference. You’ve probably heard that Apple recently announced the iPad. The absence of Flash Player on the device seems to have awakened the HTML5 vs. Flash debate. Apparently, it’s the final nail in the coffin for Flash. Either that, or the HTML5 community is overhyping its still nascent markup language update. The arguments run wide, strong, and legitimate on both sides. Yet both sides might also be wrong. Designer/developer Dan Mall is equally adept at web standards and Flash; what matters, he says, isn't technology, but people. Dan Mall is an award-winning interactive art director, designer, and developer. He is an enthralled husband, Senior Designer at Big Spaceship, former Interactive Director at Happy Cog, technical editor for A List Apart, and singer/keyboard player for contemporary-Christian band Four24. Dan writes about design and other issues on Twitter and his industry-recognized site, danielmall.com. Great piece on an often misunderstood issue. I have found that Art Direction is more readily understood in USA than in UK. There should be “graphic” in front of “Design”. Just “Design” must mean more broad broad broad. Thanks for the distinction/definition. I’d love to hear more of your thoughts on art direction vs. creative direction. I’d like to submit that your analogy of loving your wife is slightly inaccurate. I see it like this. The love would be the message or the content. The flowers and smile would be tools from your toolbox. The art direction then would be the process (and wisdom) of deciding how you wanted to convey that message to her and recognizing that doing it with a scowl might be the wrong tactic. I found this article extremely interesting and informative. I have only got a few years experience in web design/development under my belt and art direction is something that I have not been introduced to until now. I have heard the term thrown around but never really understood its importance during the process of designing a site. This is something I will definitely be looking into further to help with my own learning. bq. I have heard the term thrown around but never really understood its importance during the process of designing a site. This is something I will definitely be looking into further to help with my own learning. That’s the best response I could have hoped for. Thanks for the affirmation, Adam. A fantastic perspective. Thanks for putting it all into words. I understand the difference, in an advertisement agency is common to have separate departments, but in web design, I’m used to work in very small teams, usually the same person does both jobs, so people assume that the designer’s job is to take care of everything. I love the way you are defining art direction Dan, I also think it’s helpful to define what the so-called “blogazine” is when it’s _not_ an art directed design. In my opinion, Smashing Magazine is confusing art direction with editorial design. I think that’s a more helpful term than “blogazine”. This isn’t to say that the ability to create a unique page for a post on your blog is good or bad, but there are editorial decisions the designer is making. Whether they are good decisions or not isn’t the point. Using this kind of terminology, even if it’s borrowed from print design, allows us a language we can use that isn’t misleading jargon like “blogazine”. One of the most insightful design (and art direction) articles I’ve read on the web. Most of us forget the two are separate functions with different tasks. This was a very interesting read, but I think the design side needs more focus. Design by itself is a much broader entity than art direction—it includes art direction. Art direction is a form of design. I think you need to focus your definition of design before the distinction between the two becomes useful. bq. Design by itself is a much broader entity than art direction—it includes art direction. I see what you’re saying. I “responded to a similar question on Twitter”:http://twitter.com/#!/danielmall/status/29479181697, but I think it’s the difference between Design and design. Because this article was for _A List Apart_ for people who make websites, I took for granted that readers would inherently qualify “design” as “visual design” or “graphic design.” I certainly could have been more explicit about that, but I do think that art direction and visual design are separate processes and should be treated as such. One involves the execution of the other, but they are distinct. This article made me a little confused, maybe because I’m not a native speaker. But to me art direction seems to be another expression for the concept of a design. Anyway I’m convinced now that as inexperienced designer I really need a more experienced art director. Great read Dan, thanks for taking the time to write this article. I’m interested to hear your thoughts on art direction vs. creative direction. Any general insight you could share with us? Hi Dan, thanks for the article. I kind of disagree because to me art direction sounds a bit too old fashion as a concept and it hasn’t evolved much so it doesn’t apply when we talk in terms of interactivity. “The Wikipedia says (Wikipedia)”:http://en.wikipedia.org/wiki/Art_director “the art director is in charge of the overall visual appearance and how it communicates visually…” I think the term “User Experience Designer” or “UX Architect” works best for the web even though some people think all web designers should be UX designers the fact is that it doesn’t happen. I like Phil Coffman’s quote but I’d rather say “the designer is more concerned with execution, while the UX Architect is concerned with the strategy” (if we are talking about an interactive medium). “defifee”:http://www.alistapart.com/comments/art-direction-and-design/P10/#12 and “Sullivan”:http://www.alistapart.com/comments/art-direction-and-design/P10/#13 : My response to both your comments is similar, so I’ll address them together. To me, creative direction is about concept and strategy. Art direction is the process of translating that concept—that creative direction—into visuals and honing in on the emotion that needs to be conveyed. bq. I’d rather say “the designer is more concerned with execution, while the UX Architect is concerned with the strategy” (if we are talking about an interactive medium). This is where it gets really hairy. Roles really complicate this distinction, because art direction doesn’t always have a direct correlation to an art director. Likewise, I don’t believe a UX architect should be responsible for strategy, although the job often falls to someone in that position. An archetypal interactive design team where everyone’s title actually describes the responsibilities might look something like this: creative director, strategist, art director, graphic designer, interaction designer, user experience designer, information architect. Honestly, I probably wouldn’t like working on a team like that; it either causes a tremendous amount of overlap, or each person is confined to a very finite set of functions. Often, the missing roles are adopted by the remaining team members, but that doesn’t mean it’s inherently their responsibility. I believe strategy starts with a strategist and creative director, but, in teams without them, UX architects (as well as others) often rise to the occasion. Dan – Great article. I’d love to see you explore the realm of creative direction and how it fits with the other two. I have several problems with this article, partly from a healthy aversion of anything that steers close to marketing guff (brand values and all that), but partly from the fundamental misunderstanding of design throughout. The example of your bad design of the not-for-profit site is not the result of a lack of art direction but simply bad design, nothing more: you gave the client what you thought they should have instead of properly solving the design problems. This is a widespread issue among professional (graphic) designers who then start to think that they can fix their faults with art direction. Wrong. Another stage in the process and/or another person in the process is a crude patch on a fundamental flaw. Fix yourself and be a better designer without abdicating the responsibility to a person (who, as you suggest, quickly bloats into a committee – and they always produce bad design). Design includes art direction – or thinking as I call it – as well as problem solving, technical skills etc. Instead of going off on a ego trip and drawing in the latest trends, style sheets and typography flairs, to the detriment of the end result, a good designer should be just that and avoid doing half (or less) of the job. Thanks for your comment, Philip. I think the difference of opinion stems from the discrepancy in the definition of design. What you’re talking about as design is problem-solving, planning, thinking, and overall strategy. As I mention in some other comments, I’m juxtaposing art direction with _visual_ design or _graphic_ design, the act of executing a piece of work that’s perceptible by the five senses, not Design in the larger sense. bq. The example of your bad design of the not-for-profit site is not the result of a lack of art direction but simply bad design, nothing more: you gave the client what you thought they should have instead of properly solving the design problems. Absolutely. More granularly, it’s a result of the lack of creative direction and art direction, which you could sum up as bad Design (not bad design). My point was that I simply couldn’t solve the problem through improving my typography, picking better colors, or making sure my grid was more strict. If you haven’t already, I encourage you to read through the other comments, as I hope it’ll give you a more qualified sense of my use of the term “design.” I completely agree with the sentiment of your comment, but there’s a core difference in the way we both use the word. Thanks for this very good article. Inspiring and it’s make me think a lot. Could we also say that all the small details in an interface are related to the art direction? I mean, when we look an interface and we get excited about the small details and the emotion behind it, I’m not sure if I should put that into design or into art direction. Hi Dan, interesting article. However I disagree with your definition of a Graphic Designer. A trained Graphic Designer has gone to school to learn how to think, not just how to execute. Call it art direction if you want, but we call it critical thinking and it is a skill present in any good Graphic Designer. Successful visual design sends a message about the content. It is rooted in an understanding of the goals of the design, both tactical and emotional. I think the issue is how the word ‘design’ has been broadly used for ages. Design is the process of developing an artifact focussed on people and how those people interact with it Think of a book. Where’s design in a book? inside it. Its a matter of paper color, margins, typography…all those elements are set to provide a better interaction between book and reader. In a website or digital environment in general designers should actually b more involved with the structural side of things such as information architecture and interaction design. The way the website(or the book) looks is something different. It must indeed be visual appealing to attract, to stand out in the book store’s shelf, to be more attractive than its competitor. Its about selling and that’s when probably art direction is relevant and it is because its part of advertising which is part of promotion which is part of marketing. Thinking of the entire Marketing Mix, Design should b the product itself while art direction should b Promotion. To sum up I see as 2 completely different things and still related to each other because in the end we are talking about the same product but the profile of professionals who work either as designers or art directors I think is quite different. The perfect blend of the two is what makes a site click for me. I’ve been to way too many sites over done with artwork and artistic design, yet nearly no content. That is a major turn off. That’s why you truly appreciate the sites that somehow, maybe by luck, just nail it. Thanks for your thoughts, Clinton. Hopefully evident from the article, I disagree, but I definitely understand your perspective. For what it’s worth, I _am_ a trained graphic designer, and I still see this common problem among trained as well as untrained graphic designers. I see it as a problem of semantics and nomenclature; as I mention in a few of the previous comments, there’s a difference between Design and design. SVA has a wonderful Designer as Author program, but it’s no coincidence that a hefty portion of the facultyãƒ¼Steven Heller, Gail Anderson, Veronique Vienne, Stephen Doyle, Louise Fili, and moreãƒ¼have had long and successful careers as art directors. That curriculum teaches designers to be much more than they are (author, thinker, storyteller), implying that, by default, designers’ skill sets generally include much less. bq. Its about selling and that’s when probably art direction is relevant and it is because its part of advertising which is part of promotion which is part of marketing. Thinking of the entire Marketing Mix, Design should b the product itself while art direction should b Promotion. I see it a bit differently. If art direction is about feel, you’ll notice a lot of art direction _within_ the book, especially if you look at the processes of prolific art directors who specialize in book design like Chip Kidd or Barbara deWilde. A lot of care is taken to choose appropriate typefaces or the type of margins and layout to communicate a certain feeling about the book. A book for transgressional fiction author Chuck Pahlaniuk looks different than one for humorist and often self-deprecating David Sedaris, because it needs to _feel_ different. Art direction and visual design are most effective when approached holistically. Their impact is severely dampened when fragmented. Been batting this around my brain for the last couple months, and what I’ve come up with may or may not apply…but it’s how I look at things, at least. Graphic design is no more and no less than the discipline considered with the visual representation of information in the most relevant way possible. This typically does include other visual creative disciplines such as photography or illustration, but the implication throughout the industry seems to be that design is the alpha male, and the others simply support design. Art direction, meanwhile, seems to take a more holistic approach, and treats graphic design as simply one tool in the toolbox. Witness the two most common fields for an art director to be employed: advertising and editorial design. In each case, good design is imperative…but in a conceptual framework is the true spine that holds everything up. Paying careful attention to the details matters without a doubt. But having an underlying conceptual framework that leaves open the possibility to breaking the rule for greater emotional resonance…that’s the higher calling, whatever we call it. Design isn’t everything. Art direction encompasses everything. “commercial art” was a major in school, and it appears, now, after all these years, it was more accurately design and not direction that i studied. true, we endeavored to evoke an emotional connection, but more in an ethereal, artsy sense and not a freudian, scientifically “directed” approach. Thanks, Dan. One thing I didn’t hear discussed that should have been and would have made the article even more interesting was the role of Art Director and the designer with regards to addressing the target audience. I find in my work it is the first thing I define and address. It also focuses a lot of the design decisions and art direction. I am very glad to see that my school is incorporating Art Direction into my Graphic Design education. I think it is the difference between Design and design that is important, as you have stated in the comments–and there is no need to classify this distinction as being highbrow. As far as education is concerned, I think there is a big distinction between academic and professional education. With the latter focusing more on meticulous execution and the former focusing on concept _and_ execution. For instance, when my class is briefed about an assignment, we are usually pushed to start from a general research into the topic at hand, and then further define, deduct and refine the more concrete visual implications from there. I think this is what you might call “Art Direction” as well. This discussion reminds me of the discussion “UX Professional isn’t a Real Job”:http://thinkvitamin.com/user-science/user-experience/ux-professional-isnt-a-real-job at Think Vitamin. Art Direction is part of a designer’s job, but whether there is one designer dedicated to Art Direction in a corporation will probably depend on the size and business strategy of said company. In conclusion, I think it is a distinction that _can_ be made, but with caution. And definitely not on an educational level, but rather later on in a company, when projects have become too big to let one person do art direction, execution, planning and everything else that I am not summing up for the sake of brevity . . .
Enjoyable read but much of what your saying really boils down to the idea. Many design tasks overlap Art Directing and vice versa. From font and imagery choice to color. Although I agree with much of the article, the way you separat tasks according to role, it sort of paints the picture that the designer handles the production while the Art Director decides what mood a particular image should create, which isn’t really the case. I think the bottom line is without an over arching idea or vision, the design will fall flat. Art Director – an experienced web designer, competent manager, the art director should be developed spatial imagination, the ability to inventing. Ability to communicate with people is important: to defend the point of view, to carry on dialogue or presentation. The art director defines drawing and maintenance stylistics, a web design direction, supervises work of web designers, decides on giving design options to clients. Sometimes there is a so-called senior designer – in fact, its art director, who himself creates a web design, and oversees activities of several designers. It’s really fine perspective about both. we like it and thanks for sharing with us.